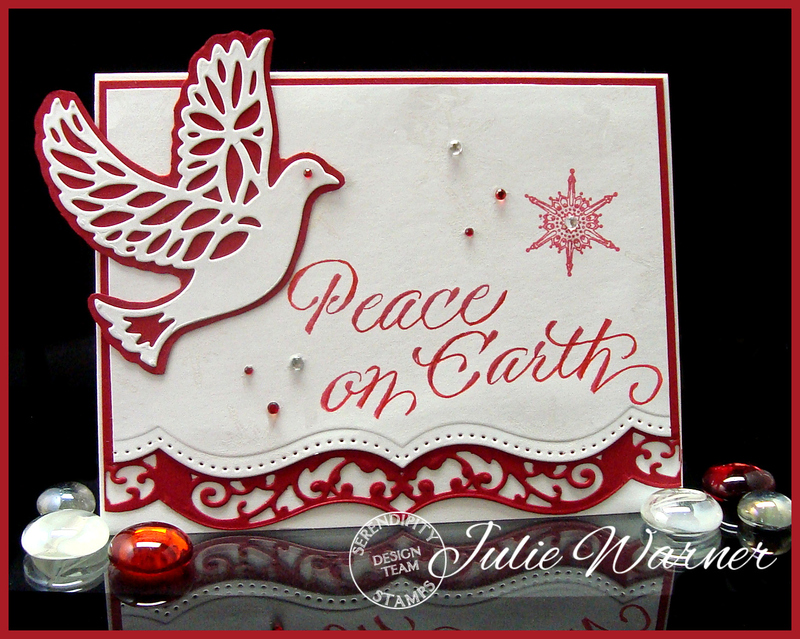 Serendipity Stamps is having a blog hop today to show off a beautiful new Bird die and Peace on Earth sentiment. We will all be showing the new die as a Christmas card and some for a non-Christmas card. One random commenter will receive $20.00 off their next Serendipity order! On my Christmas card, I die cut the beautiful bird in white and traced around the die on red and fussy cut it to attach behind the white die cut version. The sentiment was stamped on white and I used a bracket border die to cut the bottom. I used another die from the border set to cut the red layer beneath it. A red snowflake and some red and clear crystals were added to finish my 5.50 x 4.25 card. For my non-Christmas card, I went with a sympathy card. 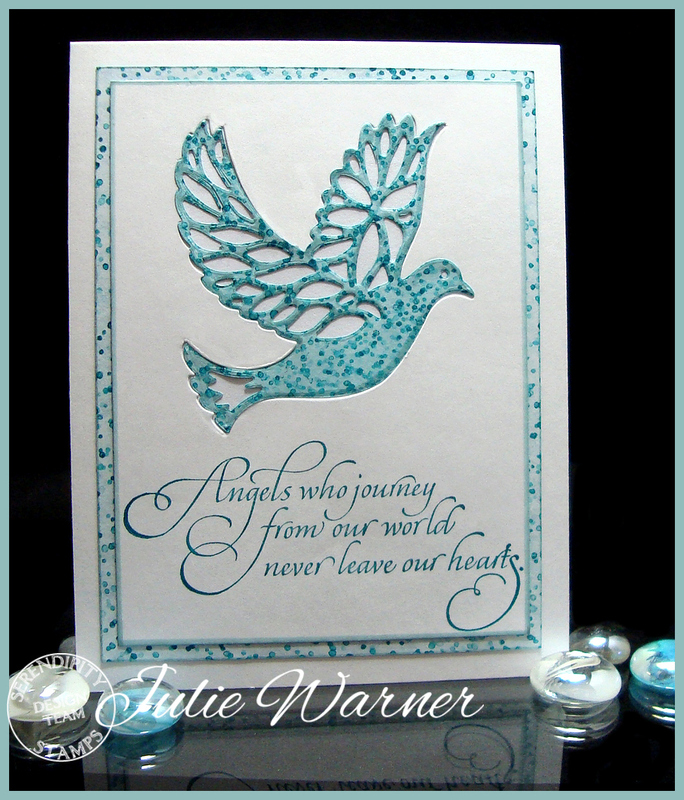 After stamping the sentiment on the lower section, I die cut the dove above it. I used some blue-green Copics to color the die cut bird then used the ink spots image to add the dots on the bird and also on the light blue layer. The stamped die cut bird was then added back into the empty die cut space. The finished card is 4.25 x 5.50. Be sure to leave a comment on each blog and you’ll be in the random drawing to win $20 off your next Serendipity Stamp order! A big Congrats to Gabby (Gabalot), the Featured Stamper on Splitcoast (FS342)! She has a big, beautiful gallery and I chose THIS card to case. 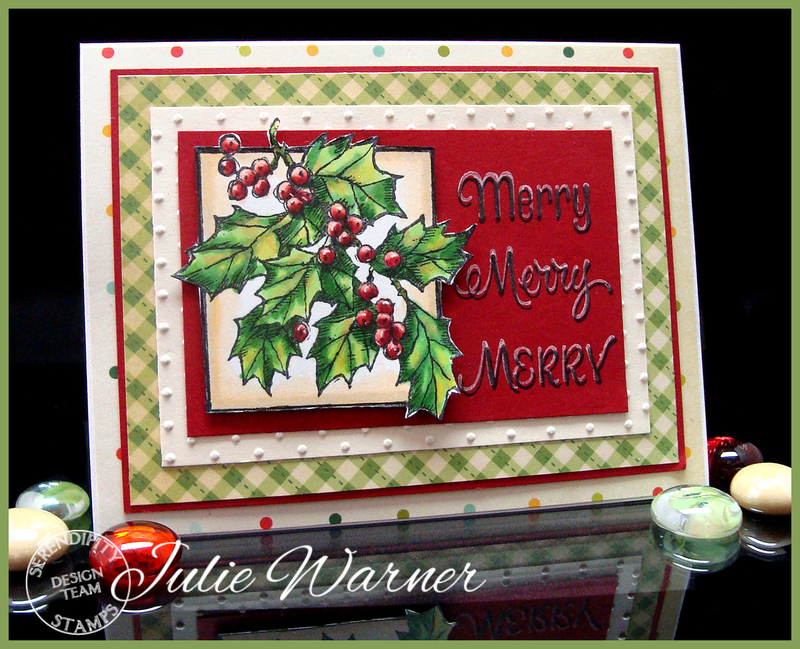 I liked the borders on top and bottom so I kept the layout and the red and white (& added green) colors, but I turned it, used different images and made mine a Christmas card. The images are from DRS Designs. After stamping the string of lights across the top, I used a Spellbinders bracket border die to cut the bottom in 3 sections. I attached two stamped plaid sections, one red & one green, together and added the cut off borders on top. The greeting and lamp post were fussy cut and attached to my 5.50 4.25 card. Congrats again, Gabby, enjoy your week! Thanks so much for stopping by! 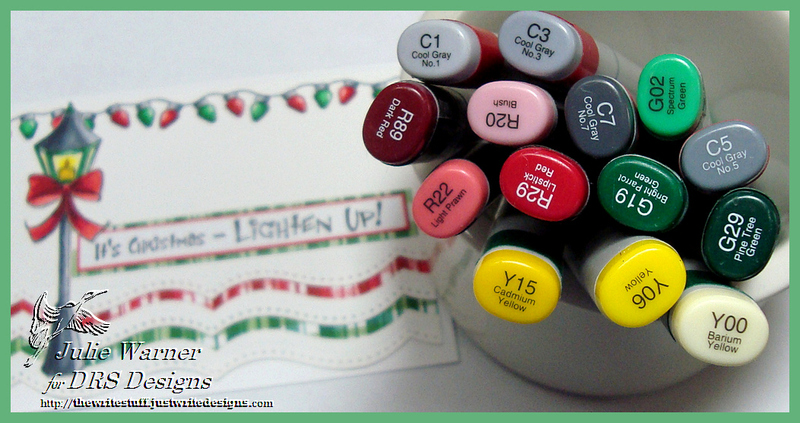 Welcome to a new challenge for Serendipity Stamps! And my first as a new Design Team Member for Serendipity Stamps! The Serendipity Challenge this week is Polka Dots or Gingham! 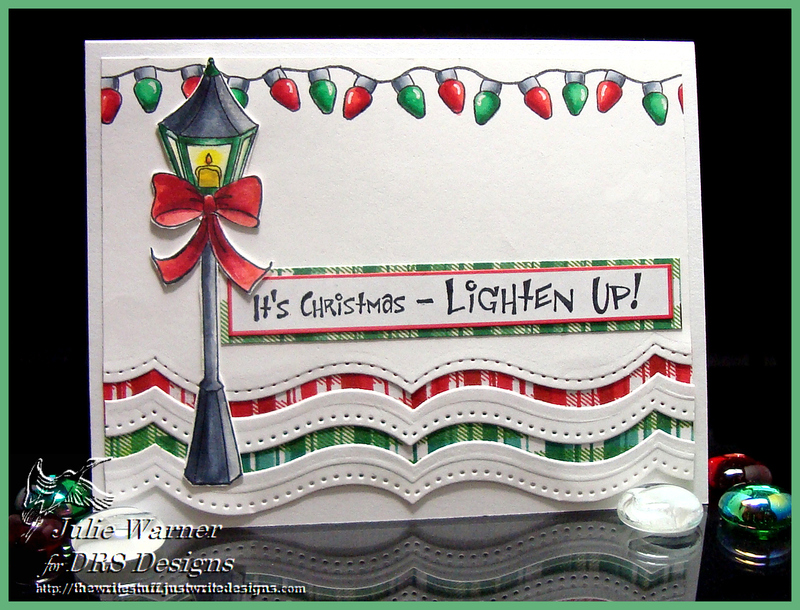 You can find all the details on how to play along with us at the Serendipity Stamps Challenge Blog. With each challenge we always have a gift certificate up for grabs to a random player. On my card, I went with both polka dots and gingham. 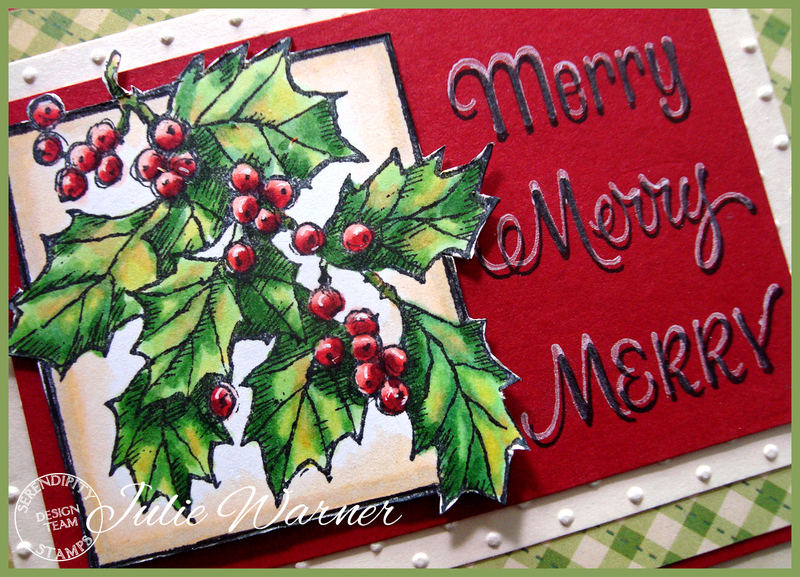 I stamped this beautiful Holly with Frame image, colored it with Copics and fussy cut it. The red panel was stamped with the greeting first in the white ink then overstamped with the black ink. It’s attached to a vanilla panel embossed with the Swiss dots then to a gingham piece of designer paper. The finished card is 5.50 x 4.25 and these are the Copics I used to color it.